Includes documents from the “Conspiracy of Equals” led by François Babeuf, a precursor of modern communism and Declaration of the Rights of Man and of the Citizen. Writings of the hero of the French working class, Louis-Auguste Blanqui, whose followers originated the word ‘communism’. See also Anarchism Subject Archive. Documents of the proletarian uprising in Paris in 1848, a revolution which spread across Europe before being drowned in blood as Louis Napoleon assumed power and proclaimed himself Emperor. Detailing the first workers government ever created, with primary documents describing the Commune and the events leading up to its creation and what happened after its fall, a time line of the Civil War, and an extensive photo gallery. 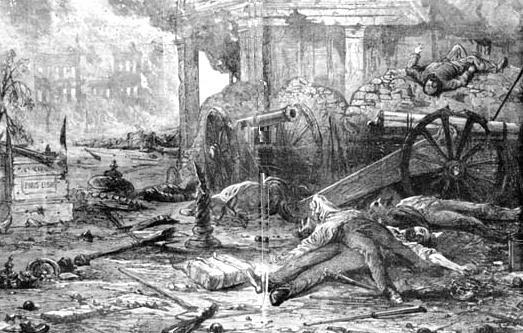 France–1871 and the Franco-Prussian War. Includes History of the Seccond International and links to Paul Lafargue and Jules Guesde Archives. The Charter of Amiens, 1906. Mikahil Bakunin, the most famous advocate of anarchism, recognised Proudhon as his teacher and spent much of his life in France. The hey-day of anarchism in France was between the Paris Commune and the World War I. See also: On the Anarchists, Jean Jaurès 1894. Including writings of Maurice Thorez. Includes the last letter of a group of foreign Communists who died as heroes and martyrs of the Anti-Nazi Resistance. Includes the “Manifesto of the 121,” published in 1960, as France stood on the precipice of civil war and documents of the PCF. Algeria won its independence from French colonialism in a long a bloody war, during which much of the workers' movement in France failed in its duty of Solidarity. Clashes between police and students brought the country to the brink of civil war. The events in the streets of Paris in May/June 1968 inspired young people across the world, but their ultimate failure to achieve revolutionary change triggered the development of new political and ideological currents, which would become influential across the world.